Supplies. Music folder. Lorenz Publishing Company #30/1833L. Published by Lorenz Publishing Company (LO.30-1833L). The latest edition to our line, this 9x12 folder with 1/2-capacity gusset pockets is made of a castillan padded outside and moire inside, with sturdy metal corners and sewn edged. It features a sealed clear hand loop, pencil holder with mechanical pencil, sewn-in bottom retention strap, and 7 string-elastic stays. This folder is lightweight, comfortable, durable and top of the line! November 03, 2017 Great folder! Very comfortable, and for the most part, perfect for our church choir. Not designed to hold something as large as a hymnal. ... The clear plastic hand strap is stretching out already after one use...won't it get too lose? The gussetted pockets seem to be a cheap plastic... will they crack at the seams long before the rest of the folder needs to be replaced? The pencil holder is in a vertical position at middle of top edge on right inside cover... it's difficult to align my pencil "behind my music" to reinsert into place. A more practical "pencil position" for me would be a horizontal position along the top edge OR a vertical position on the far right of the right inside cover AND far left of the left inside cover. Might review again after a few weeks' trial. Not convinced it will last so ordering a more expensive Black's Deluxe as backup. it in my hands during our upcoming spring performance. It is worth every penny! 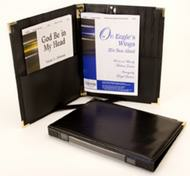 New to choral singing, an experienced choir member recommended this type of folder. This is an excellent product, Hold all type of Music is well made, great design, and the pencil is perfectly located, is invaluable to me. 42 of 74 people found this review helpful.